For long many have yearned for the magical land of Ladakh “Land of high passes “, that mystical place nestled near the foothills of the mighty Himalayas. One of those places that finds itself in the list of elusive places in this country even today. There have been many who have trudged out there and have come back with tales galore while for the rest the tale was yet to be written, the wonders were yet to be gazed upon, the cold wind on the face coming afar from the Karakoram up in the north and from across the pangong was yet to be felt …. 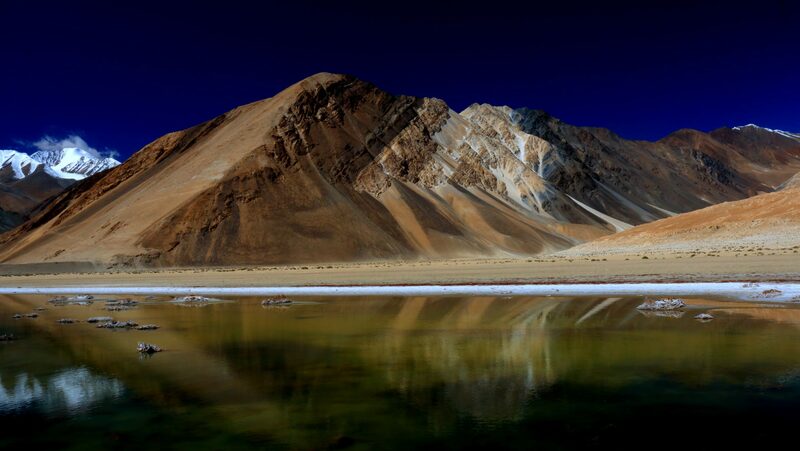 What is Ladakh, where is this fabled place that has mystified people across the world. Nestled high up among the Himalayan Ranges reached through narrow passes, with each passing day the region is opening up to those willing to make the effort to come out here, braving physical discomfort and banking on their mental will in order to experience something that still is different from what they would have seen till date. It is my personal belief that no one can see Ladakh only once and not make the resolve to see it again. Many succeed in this endeavor while for some it remains a resolve that is yet to be fulfilled. Then there are those who do the journey by road starting from all corners of the sub-continent braving diverse conditions and passing through the length and breadth of the county till they reach the base of the region from where the far boundaries of this region actually begin to manifest in the visuals that are presented. Rohtang La(13050 ft) : Rohtang La, visited by many but still independent and tamed only as long as it wants. The roads are still broken, the descent steep and the spirit of the pass when the winter comes is still wild, it really does not matter that hundreds visit it, it still remains ROHTANG LA. The first pass that is encountered by those who trudge on the Manali Leh Highway, an iconic highway in its own right. Rohtang is visited as a day trip too by many who come to spend some time in the town of Manali. Locally known as “place of corpses “its reputation has been built over the years with its deceptive look and easy accessibility luring people who suddenly find themselves stuck with a pass that has changed its look from something simple to definitely sinister, however on a clear day Rohtang is definitely quite Tame. The pass gets blocked in the winters how in May/Jun the pass once again open, a white Rohtang is the stuff of legends. Baralacha La(16040 ft). Baralacha La , the second pass after the town of Jispa on the Manali Leh Highway. For anyone who has travelled on the Manali Leh highway, the name Baralacha la is all too familiar. It is deemed a treacherous pass on account of the amount of snow that is dumped here. One one of my trips it shimmered in the morning sunlight as the sunrays reflected off it and the towering peaks of snow all around. A extremely lonely yet lovely place it definitely leaves its mark on all those who visit. This pass decides the fate of this highway and its closing time for any particular year. Not one to be taken lightly, this pass stands tall and mighty overseeing the entire landscape which sees three different mountain ranges – Pir Panjal, Zaskar and great Himalaya meeting each other. Nakee La (16601 ft): The pass is neither windy nor crowded, but is dusty, aloof in the midst of the high mountain peaks at all sides, one generally reaches this pass only after post lunch while on the way to settlement of Pang and the sun beats down remorsefully while the chill in the afternoon sun is evident. The ascent to the pass is accomplished through the famous Gata Loops, a series of 21 hair pin bends that makes one gain an elevation of 1500 ft.
Lachung La. (16230 ft ) situated around 8 kms from Nakee La the pass offers great views of the Ladakh plateau and the Zanskar range of the Himalaya. It is the second highest pass on the Manali Leh highway yet totally barren and dusty. All around one can see only range after range stretching into the horizon. Tanglang La(17582 ft) .The pass which stood at 17000 plus feet above sea level gazing down mightily at all those who attempted it. Taglang la is super windy and cold. It requires an effort to stand outside the vehicle at the summit, but the views are super awesome. It is a long journey and many have transversed through mountain ranges on a spectacular and magnificent highway, have seen marvels and an earth like no other and then reach the door step of Tanglang La, at a height of 5328 mts. It was the second highest motorable pass in the earlier times, though now others have taken over this position yet it is a magnificent pass and offers the visitor a glimpse into life at 5000 mts. Khardung La (17770 ft). The pass of the million flags. He definitely made the list of being amongst the celebrity passes in this country. It is not easy reaching this pass and when there is snow on the approaches to this pass, the attempt mostly ends in failure. For long claimed to be the highest motorable pass in the world, it is visited by almost everyone who comes to Ladakh. It stands on the gateway to the Nubra valley and hence gets quite a number of visitors during the day and in the tourist season. The approach to the pass from Leh town is definitely a challenge even today owing to the steep gradient and uneven road which is broken down in many sections. It is located in the Karakoram rages and on clear days one can see the entire multiple ranges of the Himalayas in a series of magnificent spectacle. The pass has a notorious reputation of closing down suddenly on account of fluctuations in weather. It is a strategic pass as it connects the army units stationed north near to the Siachen base camp with the town of Leh.. Before the GPS there used to be only Khardung La and its greatness however after the advent of the GPS, it was dethroned but yes even now it is the pass of the million flags where boys become Men and the bike expedition suddenly seems all the more meaningful, Yes that’s Khardung La for you. Wari La(17427 ft) So what is special about Wari La, well am sure many would definitely relate to this pass but then a greater number would actually not !!! Not much is written about this pass in the internet barring few accounts documented by those who have crossed it. For the uninitiated crossing this pass is like an act of self-gratification and personal achievement. To have been to a place which has so sketchy mention and remains elusive even in this day, is worth more than numerous trips to places which are much more pretty and scenic but easily reached. Most of the tours avoid this pass though this pass is the gateway to reaching Pangong from Deskit without going to Leh. A much shorter route however desolates to the core and an incline which will leave your vehicle gasping and shuttering all the way to the top, a stretch of unrelenting 20 km steady incline. It is not in the normal itineraries and it is a pass where your knuckles go white with strain while the sweat forms on the forehead as you look ahead with concentrations while the vehicle whimpers. Khardung La seems a walk in the park on a Sunday compared to this. Chang La(17650 ft) . Chang La had called and when the call comes, it’s time to go. The icy domains of Chang La Baba, situated at a height of 17650 feet. The whims of this pass dictates whether the eastern part of Ladakh can be accessed or not by the defense forces mandated to protect the area towards Depsang Plains, Chushsul and Demchock sector. To overcome the eccentric Chang La, Kakasang La was bought into existence. The pass gets its name from the hermit Chang La baba who used to reside in this region and there is a shrine that is built out here. The access to the pass is quite tricky either side and needs careful motoring on unmetalled roads with a steep gradient. Expect snow most of the time out here, other than maybe in end sept. One finds heavy army presence from here owing to numerous army units stationed closeby. Tsaga La (15207 ft). This route is one of the few remaining total wilderness routes when it comes to tourists, with no road except a dirt track made by the vehicles which ply on these paths, one has to be careful while transgressing this route as there are no markers to indicate just about anything .One can see the bunkers of the Indian Army on the right who stand guard the safety and sovereignty of our country against possible incursions from across the border. On the left the Rezang La mastiff rises and acts as the natural barrier for the LOC. It was here that the 1962 war was so fiercely fought and lost. The scenic beauty on this sector is simply awesome whatever be the season, teeming with wildlife this is a place that makes one realize the seclusion that Ladakh once possessed. Tsaga La lies on the axis connecting Chushul to Loma through the vastness of the extreme fringes of the Tibetan Plateau whose presence can be felt out here. There is no metalled road, road signs right from Chushul till Loma Bend so the traveler needs to be very conversant with the terrain and the geography out here. Salsal La(17290 ft). This pass lay in the wildness of the Changthang region-, on the route to Chumur from Hanle . There is absolutely no tourist that one would find here, only prayer flags and a sense of utter desolateness however there is warmth in that feeling, there is no cold or bitterness. The region is extremely beautiful with the two lakes of Kyun Tso nearby. This pass is hardly known to anyone and is not on the travel route of anyone actually. Polokang La (16305 ft) The pass is not in the league of the high ones but at 16000 plus feet it does command respect. The sun shines brightly here as the Kiangs graze peacefully in the shadow of the towering ranges that rise in the vicinity. It is a gritty pass reached by broken down paths that make the vehicle rattle at every turn of the wheel. It is situated deep in the Rupshu valley and is the persecutor to the village of Sumdo, an hour away towards Korzok. Fotu La (13471 ft). Situated on the National Highway 1D towards Drass, this pass is one of the final passes for those exiting the Ladakh region It is the highest point on the highway and once can get amazing views of the snow clad mountains. There is located out here the relay station of Prasar Bharati television. The ancient town of Lamayuru welcomes the traveler after the pass if one is moving towards Drass. Namik La(12600 ft) The “Pillar in the Sky “ that’s what it is called , this is a quiet pass amongst the trio while the other two being Fotu La and Zoji La. Zoji La(11575ft) Zoji is a low altitude pass, by Ladakhi standards, not even touching 4000m. However, what it lacks in altitude, it makes up by snow. This pass is the gate from which the western disturbances enter the Ladakh region, and on the way dump tonnes of snow. That said, this is the only heavy snow pass on this route. This is a short tempered notorious pass famous for perilous traffic jams and deep slush making vehicles to crawl and drivers to curse when they try to navigate Zoji La. There are two routes, Upper & Lower however it is better to take the lower route always. Hor La(16974 ft).High up away from the beaten path lies a passage cut through rocks n mountains , passage that hold three passes and four lakes , built by the Army for the Army even the locals do not come here for there is peril at every metre of the passage , clouds play hide and seek amongst the mountains out here , and that’s where we find Hor La . Cut at over 17000 feet connecting Mahe to Chushul and is the indicating marker for the lovely Yaye Tso. Kakasang La(17880 ft). The prince of the passes, young n raw it’s the ultimate destination for the road traveler. Built to counter Chang La, it serves the Indian Army in the far reaches of Eastern Ladakh, only the best of friends actually come visiting Kakasang La, it’s a nightmare for the vehicle and the traveler is on his own out there amongst nature with no soul for miles around. Kongka La. A gentle pass situated on the Erath route connecting Tangtse to Chushul , very unassuming in nature it is the recognized by a few prayer flags and the distinct flatness between two upslope.